Adrianza is expected to be ready to go by Opening Day after undergoing surgery to repair the labrum in his left shoulder Tuesday, Brandon Warne of ZoneCoverage.com reports. Adrianza suffered a tear in his labrum near the beginning of September, though he continued to play through the injury for the remainder of the season before opting to go under the knife. 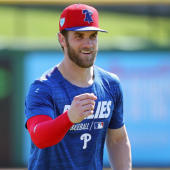 The procedure typically carries a 3-to-4 month recovery timeline; with the start of spring training a little more than four months away, the utility man should be good to go before the start of the season, barring any setbacks. Assuming he's healthy, Adrianza should have an inside track to a spot on the Twins' Opening Day roster as a utility option.